I’ve been following The Mighty Mighty Bosstones and going to their shows for over 20 years now, but I was especially excited for this HomeTown ThrowDown when I found out that The Neighborhoods were one of the openers. They are one of the many great Boston bands whose shows I missed in the early days but always wanted to see! First, the noblemen from the Upper Crust stride snobbishly onto the stage, adorned in their gilded 18th-century attire. These guys may not reveal their souls onstage but Lord Bendover, Count Bassie, The Duc D'istortion, and Jackie Kickassis, sure do bring on a kickass performance. They play a timeless hard rock enjoyed by all! The evening continues now with a different vibe, a few songs from Lenny Lashley’s Gang of One. Just one guy set off to the side of a dark and empty stage. Alone with his guitar, he stands resolutely with a spotlight shining down on him. His acoustic tunes don’t call out angrily, but tell stories with words that everyone can feel. Now, as the curtains are ripped down, The Bosstones pour out and we see a stage set to honor the old Rathskellar, “the granddaddy of Boston rock venues.” The back of the stage is decked-out to look just like the brick front of the club, including the signs “Food - Drinks - Music” and above that “Rathskellar” in the old-style German font. My introduction to the Boston music scene began in the 7th grade. I wasn’t as immersed in this scene growing up as I would have liked, but I went to a few memorable all-ages shows at some of the Boston clubs. For some reason, though I never made it down to that club, affectionately known as The Rat. It’s great to see this historical part of the Boston music scene, just as I imagine it once looked, and to see the bands that played it then playing it now! 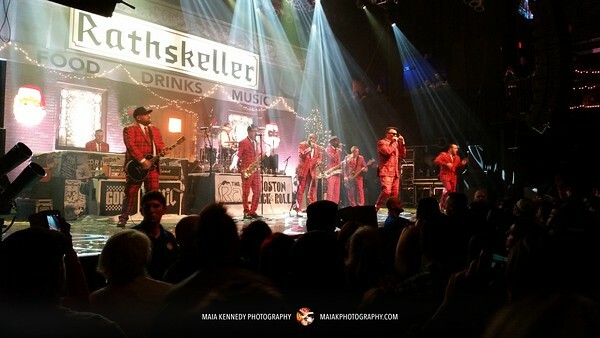 The Bosstones get the crowd excited just as soon as they enter and they keep the energy going. This is nothing new, every Bosstones show I have been to is like this. The crowd is filled with hundreds of the faithful who plan for this show all year and book their flights well in advance. They come in all ages, know all the songs, and sing along to every one. There are also plenty of new fans, for some this is their first concert, for others it is just their first time seeing The Bosstones. You can usually tell the groups of people apart by their expressions, the virgins are just as excited, but also pretty wide-eyed. The reminiscing continues as we are introduced to surprise guest, Jimmy Harold, former owner of The Rat. Dicky exclaims sardonically, “He hasn’t aged a day, but then again he looked old back then.” The laughter continues through the night, as do the songs. Many hits are played as well as cover songs, including the appropriate one titled, “At the Rat” (by Willie “Loco” Alexander & The Boom Boom Band). After almost 30 songs, the night is coming to an end, at least for the performance. Dicky comes down from the stage to shake hands, sign autographs, and chat with many new and familiar faces. The Boston music scene has always been a strong one, supported by many loyal fans. Boston bands also support each other, coming to each other’s shows as well as doing guest appearances. Saturday I saw Tim Brennan from the Dropkick Murphys, another Boston band, in the audience and I heard that he was on stage playing with them the next day. Boston bands don’t just support each other, they also support and get support for the causes they care about. The Bosstones held a raffle of old memorabilia to help out the Animal Rescue League of Boston. Some very lucky people walked away with some cool stuff, one-of-a-kind pictures of performances from the old days. Full-size pictures of The Neighborhoods, click here. Full-size pictures of The Upper Crust, click here.